M C Mary Kom on Saturday became the most successful boxer in the history of Women's World Championships by winning her sixth gold medal with an unanimous 5-0 result over Ukraine's Hanna Okhota in New Delhi. 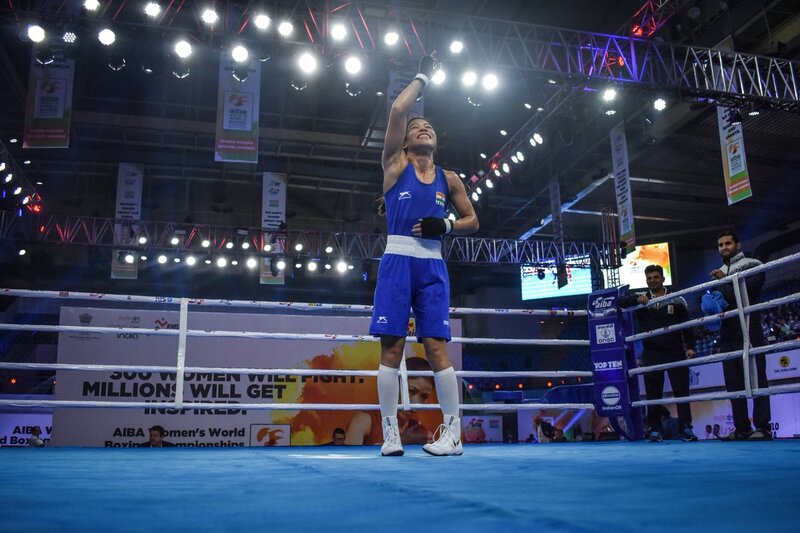 The 35-year-old Mary Kom beat her opponent in the 48kg category without breaking a sweat. She now has an incredible six gold and one silver in the tournament. With this gold, 'Magnificent Mary' also matched Cuban men's legend Felix Savon as the joint most successful pugilist (men and women) in the World Championships history. The last time she won the top prize in the showpiece was in 2010, in Bridgetown, Barbados. Before this World Championships, Mary Kom was tied with Ireland's Katie Taylor (five gold and a bronze) on the number of medals won by a woman. Taylor now plies her trade in the professional circuit. Mary Kom, a mother of three, won a silver in the inaugural edition in 2001. She then went on to win a gold each in the next five consecutive editions -- 2002, 2005, 2006, 2008 and 2010. Savon, who also won three Olympic gold medals during his illustrious career, won six gold and one silver in heavyweight in the World Championships between 1986 and 1989.